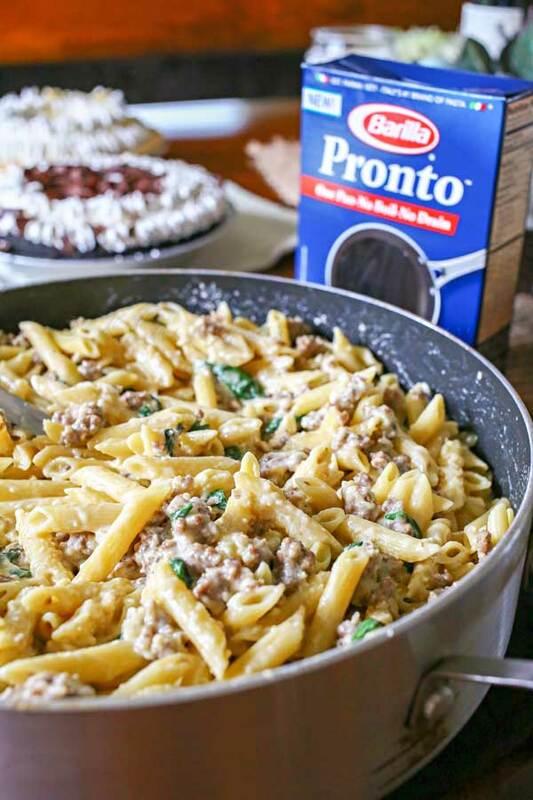 You CAN do holiday entertaining in less than one hour with easy family dinner ideas like this Spinach & Sausage One-Pan Alfredo. Simple & delicious! I know the stress is on this time of year. Not only do you have the regular everyday demands of life, but now with the holidays & guests & everything else – oh man. Life is busy & it can get overwhelming. So add to that the added stress of hosting people for holiday entertaining & I can hear you say “no way”. But today I’m going to share with you how you can pull together a holiday party in less than 1 hour & still feast like you spent all day in the kitchen. I’m telling you it can be done & it can be delicious! 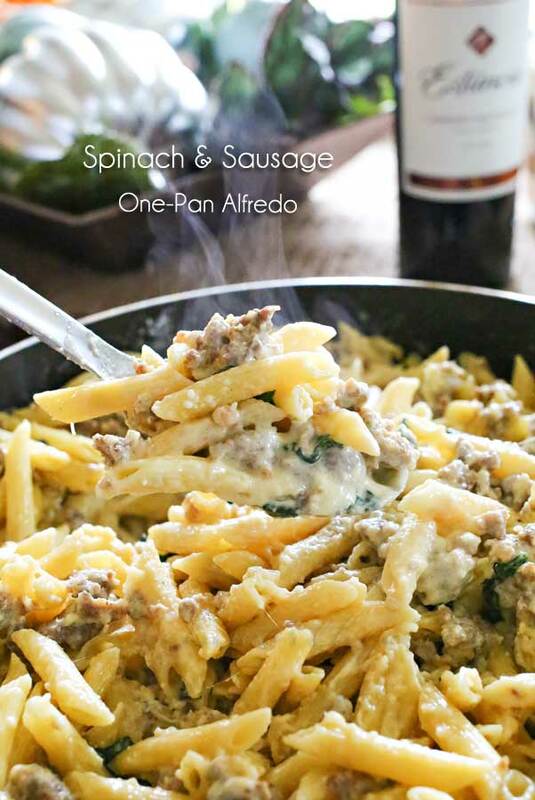 This is especially true when sharing this Spinach & Sausage One-Pan Alfredo & all the other goodies I added along with it. The key here is planning. I headed to Walmart & picked up some things that we love to serve because it makes preparing a spread so simple. 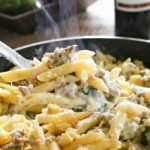 Things like crackers, cookies, pies, meat & cheese platters, rolls & wine all go great with this one-pan pasta dish. So knowing that it’s the holiday season & I could be put on the spot to host a gathering at any time, I make sure to stock up. 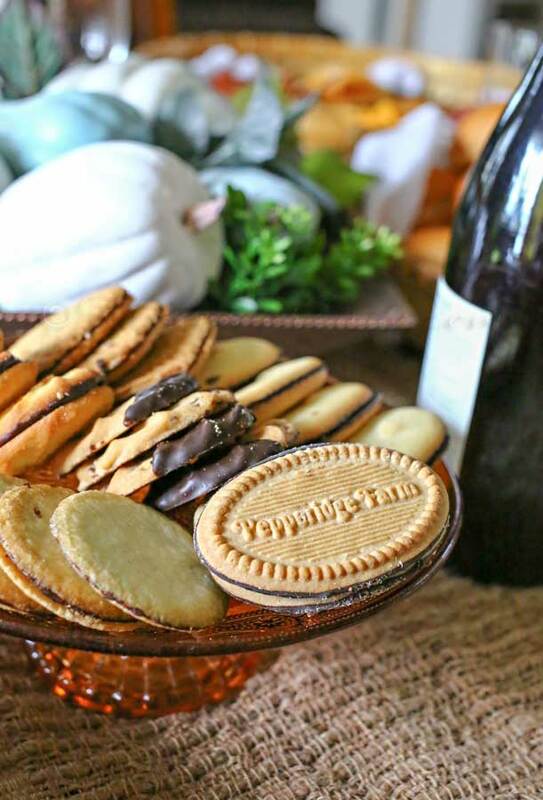 On this trip along with my other ingredients, I picked up Barilla Pronto Pasta for the dish, Pepperidge Farm Chocolate Cookie Collection, Pepperidge Farm Cracker Trio to go with my pepper jelly, Estancia Cabernet Sauvignon & Robert Mondavi Private Selection Pinot Noir because I love California wine. Being a So Cal native, I just naturally gravitate to things made in California – wine especially. 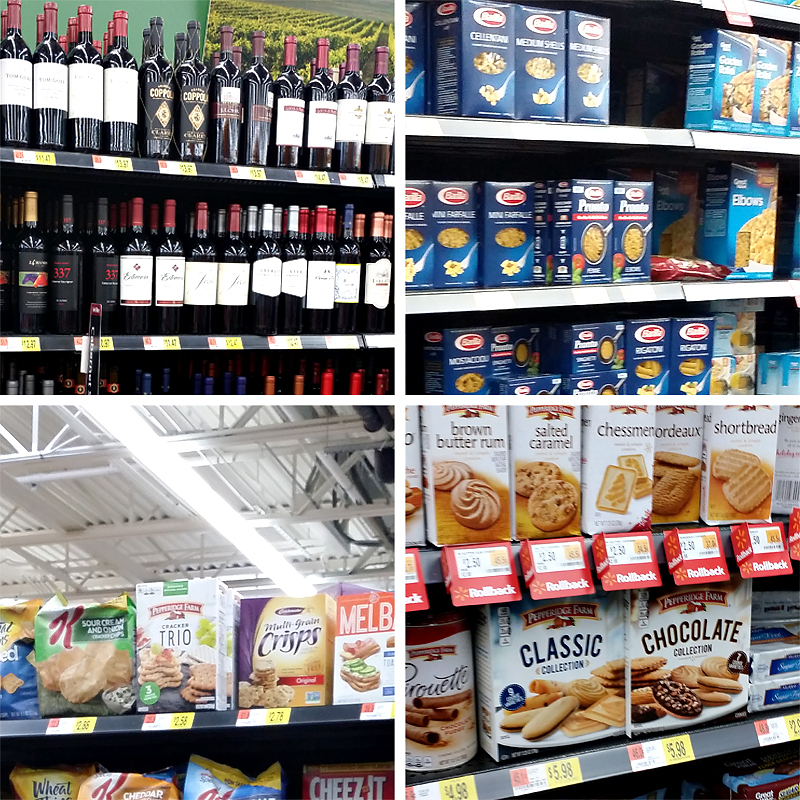 I love the premium wine selection at Walmart not only because of the great prices & value but they always have such a wide selection too! I love these Pepperidge Farm crackers. Look at the cute shapes! 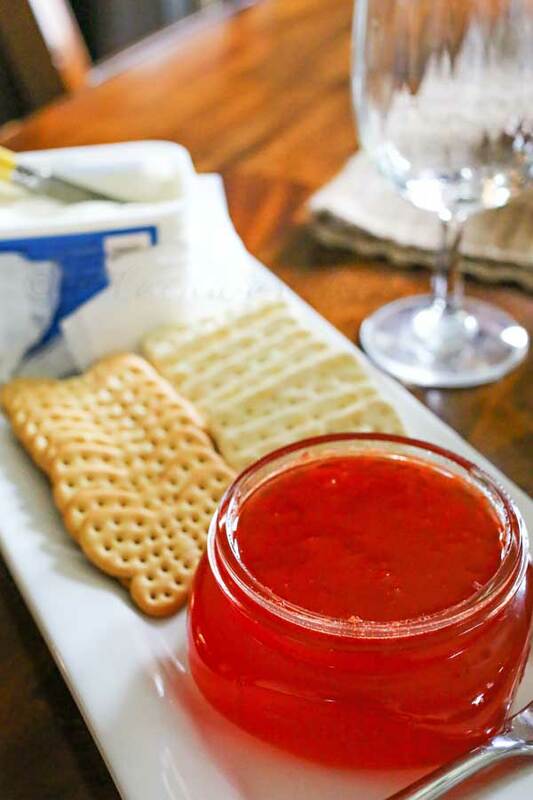 They go wonderfully with my cream cheese & pepper jelly we serve at every party. It’s sort of our thing. I LOVE it! They go great with a meat & cheese platter too. 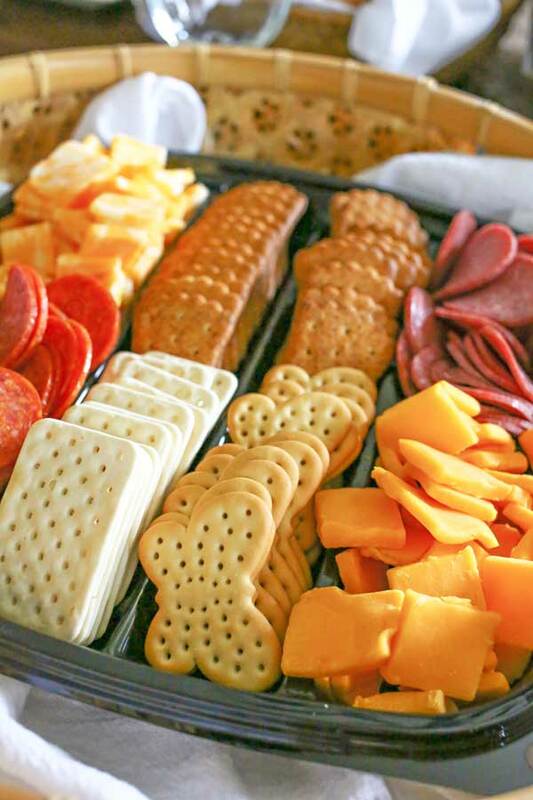 My kids particularly love this because finger foods are their favorite. I also add a basket of rolls which everyone loves. Look at these cookies! How cute they are & tasty too! This gave me a great reason to pull out my newest cake stand. I’m always looking for fun excuses to do that. 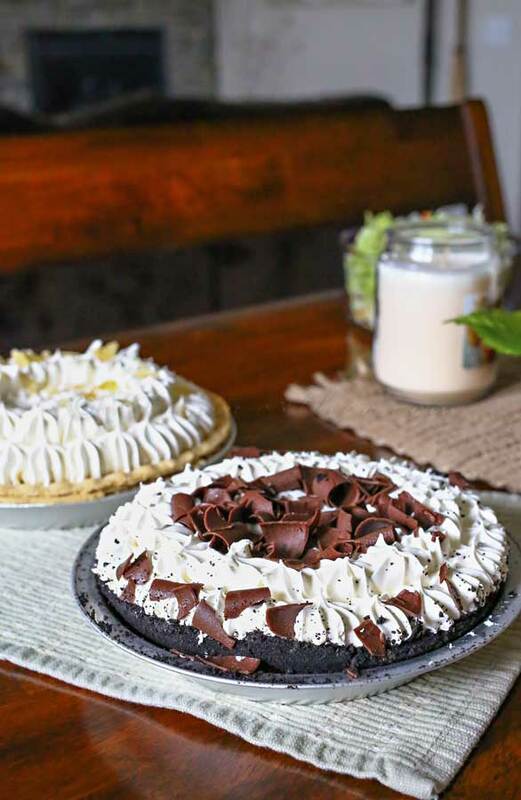 I like to have a couple pies for dessert. Nothing fancy – but it’s just nice to have something ready & easy. My secret here to getting it all done is that all these things are pretty much ready to go when you buy them. I can come home from the store- have the kids open & plate everything & get the table set up while I work on the main dish. I’m telling you – in the 30 minutes it takes to put together the One-Pan Alfredo, the family has this entire spread ready & beautiful. 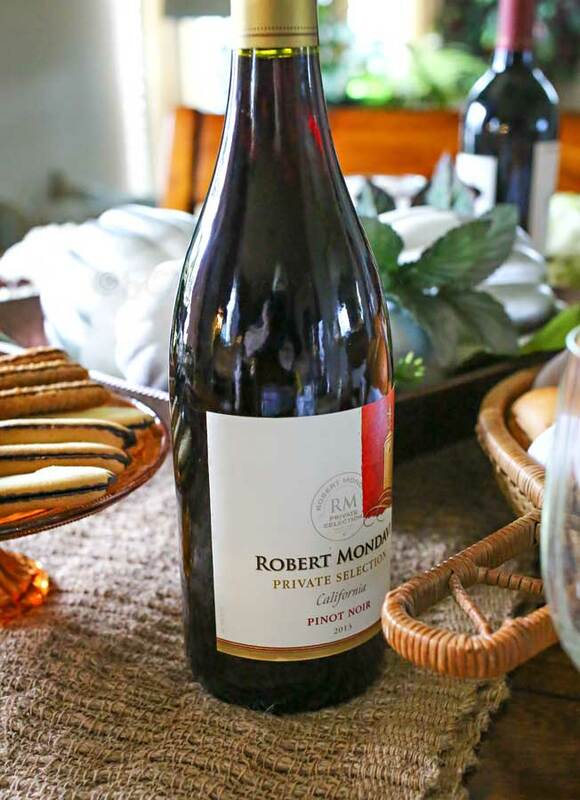 Food, wine & dessert makes for wonderful holiday entertaining. No one would ever know that you pulled this off in less than an hour! But it’s fabulous – no doubt about that! 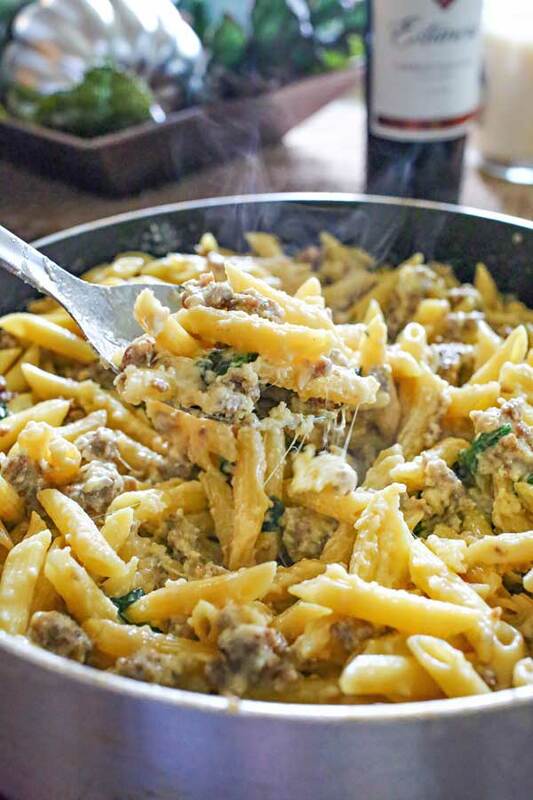 As for the one pan pasta – it’s literally amazing. I love that I can make something as easy as those meal-in-a-box dinners- but better. 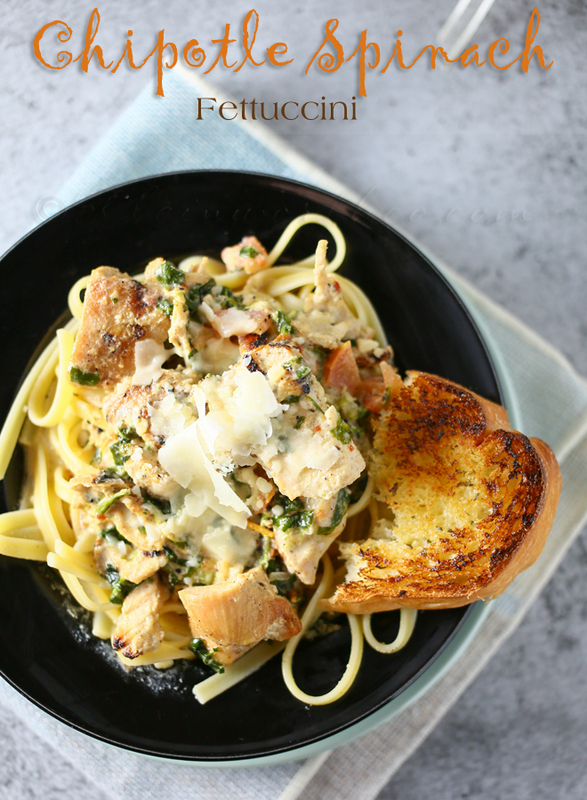 Just the pasta & fresh ingredients like sausage, spinach, chicken broth, heavy cream & cheese make this simple & easy. One skillet dinners are where it’s at! It’s so easy that it makes getting creative even more fun. For instance, chicken & alfredo is the usual pairing. But with this I chose to do ground sausage instead. 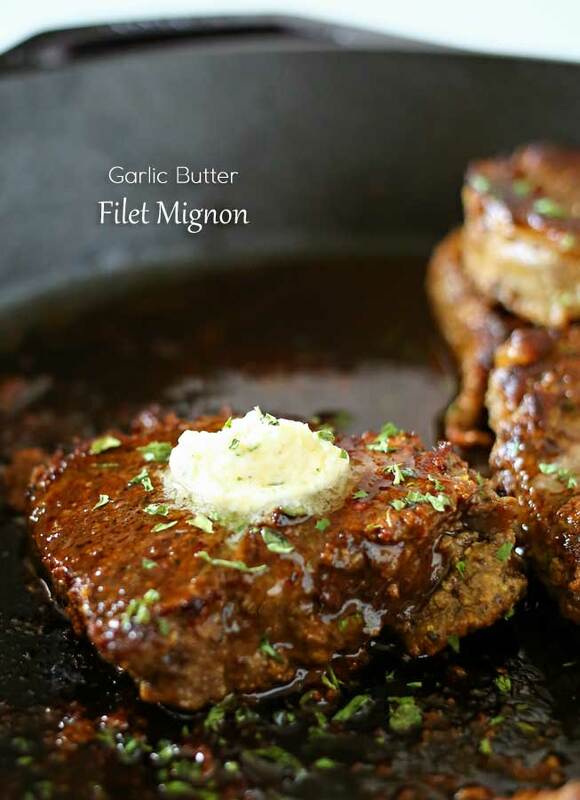 The best part – one skillet. No boiling water separately. 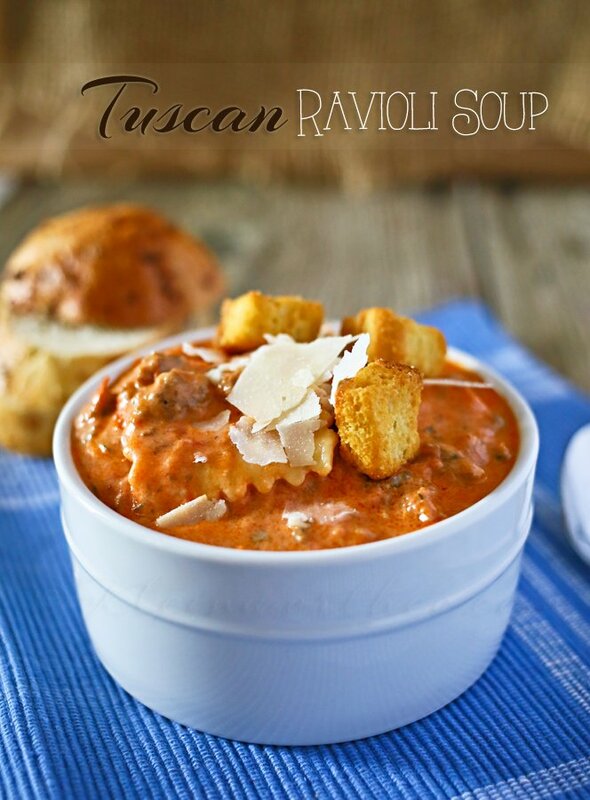 You literally brown your sausage, add in your liquids & pasta – cover & cook. Then add your cheese & spinach at the end. It’s THAT simple! You won’t believe it! Where has this been all my life? Dinner just got SUPER EASY & there is no excuse to order in anymore. WOW the flavor explosion was incredible with this. I can’t wait to make it again! You can make a delicious feast with little time! WOW them all & pat yourself on the back too! They will LOVE it! I promise. 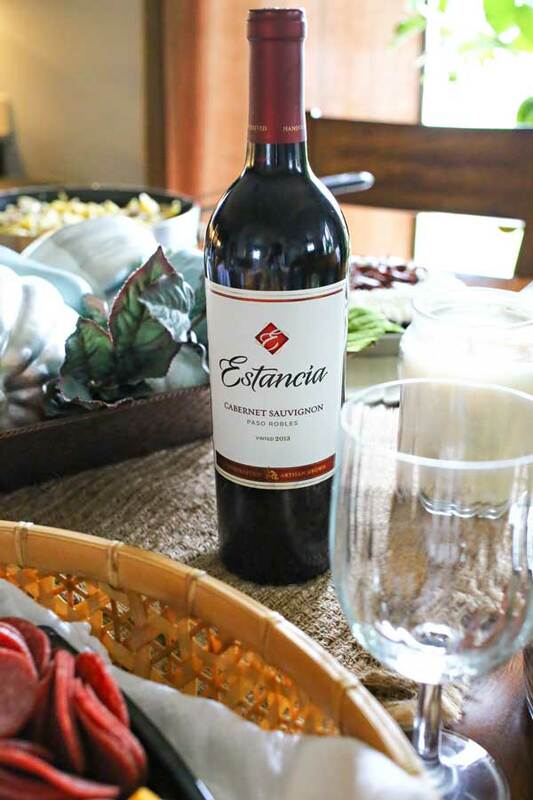 Be sure to visit the Simple Entertaining hub to learn about upcoming wine tastings, Barilla & Pepperidge Farm demos at your local Walmart Stores throughout November and December. Alfredo sauce was always one of my favorite meals!